“You could have what you wanted of [Urban’s] gifts – fantasy, realism, abstract decoration, architectural solidity. He could do superbly many things that his contemporaries could not do at all. 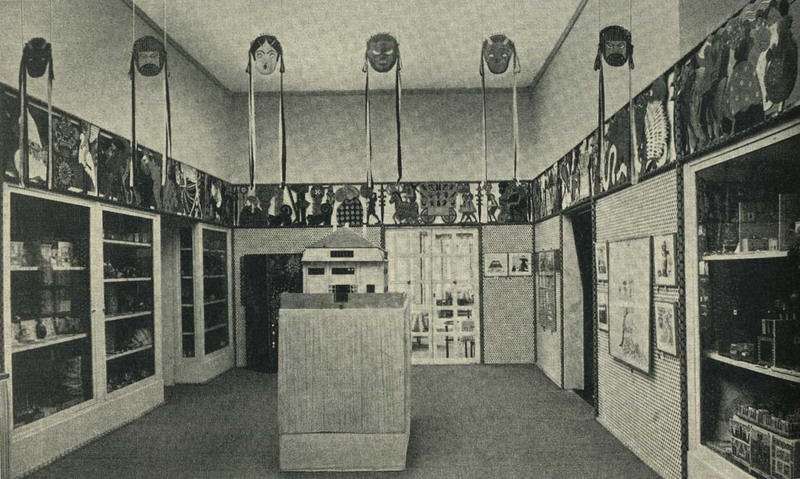 “ – Deems Taylor in Architecture, May 1934. In Urban's hands, assimilation became creativity of the highest order. He brought medieval styling to a bridge for the Hapsburg Emperor and japonistic elements to stage sets for the Ziegfeld Follies. Growing up in fin-de-siecle Vienna, he was immersed in the contemporary Jugendstil movement. 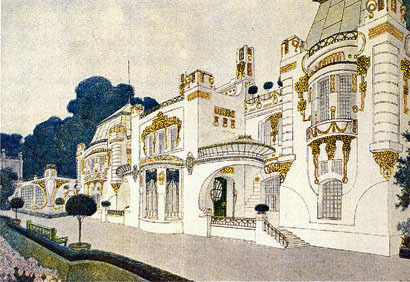 Urban founded a design group, the Hagenebund, that was similar to Otto Wagner’s Secession, but more devoted to the style of Art Nouveau. 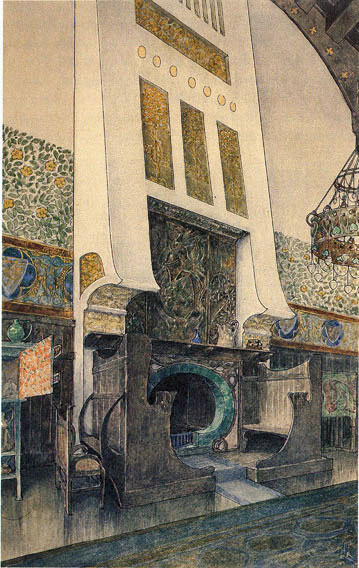 You can see the medieval influence on Art Nouveau clearly in Urban’s work. Born in Vienna, Joseph Urban (1872-1933) studied architecture at the Royal Academy of Fine Arts. He was only nineteen when he received his first commission from the Khedive of Egypt: to design a a new wing for the Abdin Palace. 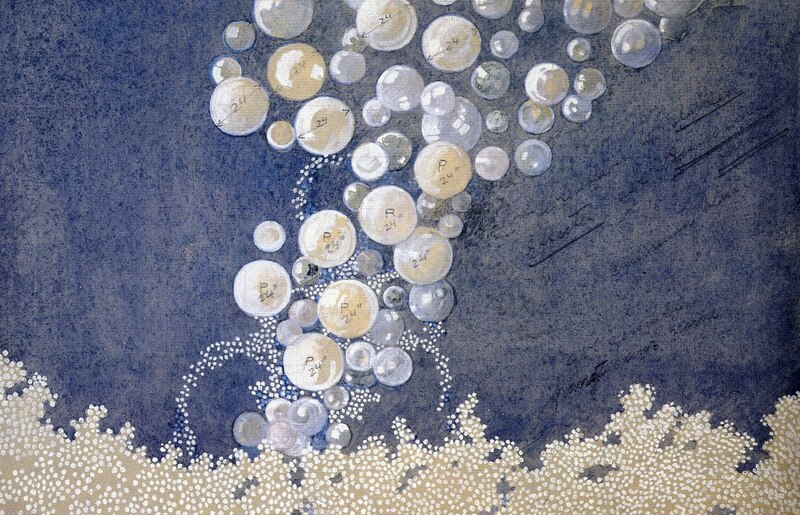 During his eight months in Cairo Urban fell in love with deep blue of the Mediterranean, a color that would be a prominent feature of his theatrical designs. “I think the indescribable blue of the Egyptian sky created my lifelong love of blue;” Urban admitted. Returning to Vienna, Urban's good fortune continued. He obtained a position in the office of the official architect to the Emperor Franz Joseph, where he received the commission to design the new Kaiser Bridge to celebrate the 50th jubilee of the emperor’s reign in 1898. As you can see from his design for the Esterhazy Palace, Urban applied his taste for theatrical settings to real life. Even the Esterhazy fireplace (one of them, anyway) has its own proscenium arch above the curved blue oval. There is even something Egyptian looking in the design of the chimney. Urban seems to have been one on whom nothing was lost. 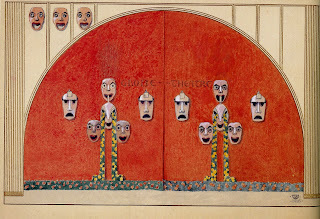 Fabulously successful in Vienna, Urban could have stayed put but, in 1912, he emigrated to the United States to become the art director of the Boston Opera Company. His first production, The Tales of Hoffmann, caused a critic to enthuse about its " perfect atmosphere and illusion." Urban explained his new concept of the theatrical thusly: " The new art of the theater is more than a matter of scenery; it concerns the entire production. The scenery is vain unless it fits the play or the playing or unless they fit it. The new art is a fusion of the pictorial with the dramatic. It demands not only new designers of scenery, but new stage managers who understand how to train actors in speech, gesture and movement, harmonizing with the scenery." Soon, Urban's services were in demand In New York, by everyone from the Metropolitan Opera to the Ziegfeld Follies. 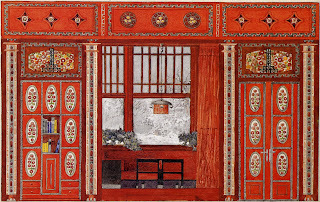 For the Met, Urban made use of his Jugendstil background; Suzanna's boudoir came straight from Vienna. For impresario Florenz Ziegfield's bevy of beautiful women, Urban created...bubbles. Vienna and architecture had been Urban's first inspirations and he returned to both in his work, if not in life. He designed the Manhattan showroom for the Wiener Werkstatte, the design group whose hopes of bringing good design to the masses were frustrated by high prices. Ironically, Urban was to design an emporium that really did reach the masses - the 1928 Kaufmann's Department Store in Pittsburgh. 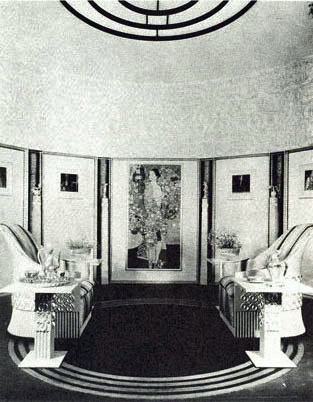 In Urban's hands, the proscenium arch of ancient Rome had become the setting for magic in an Art Deco world. Images: the Joseph Urban Archives, Columbia University, NYC, unless otherwise noted. 1. Joseph Urban - Ziegfeld's Follies, 1916. 2. 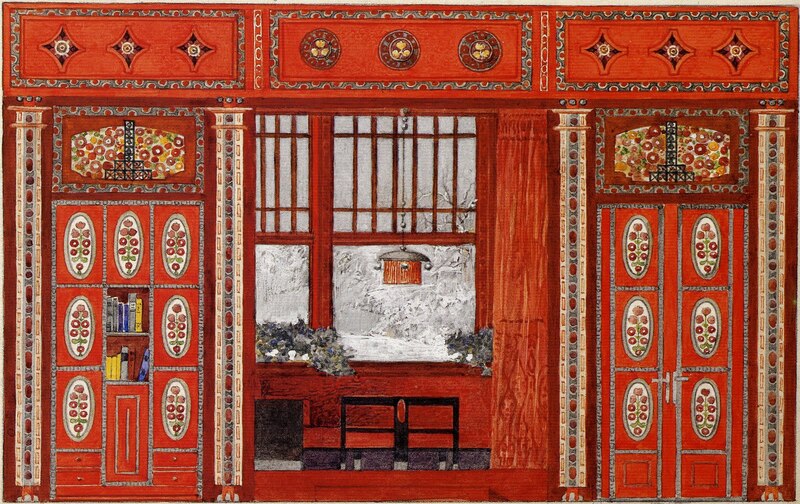 Adolf Bohm - Children's Room for the Wiener Werkstatte, 1909, Brandstatter Archive, Vienna. 3. 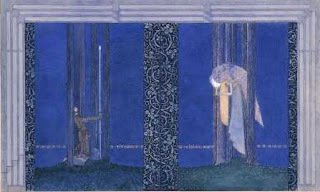 Joseph Urban - Tinture's Vision from Parsifal, 1920. 4. 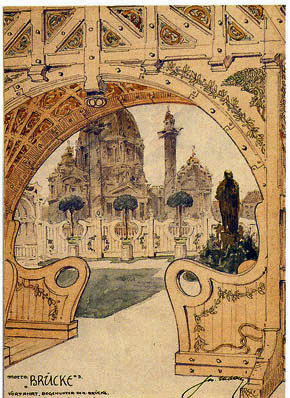 Joseph Urban - The Kaiser Bridge, 1898. 5. Joseph Urban - Exterior of Esterhazy Castle, Hungary, 1899. 7. Joseph Urban - Set for The Secret of Suzanne by ErmannioWolf-Ferrari, 1913. 8. Joseph Urban - The Century Girl for Ziegfeld's Follies, 1916. 9. Joseph Urban - Kaufmann Department Store - Pittsburgh, July 1928. 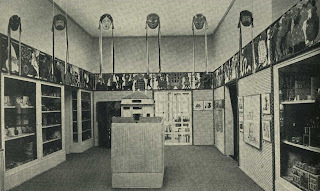 10. unidentified photographer - Wiener Werkstatte showroom - NYC, 1922. This is one of my favorite posts! 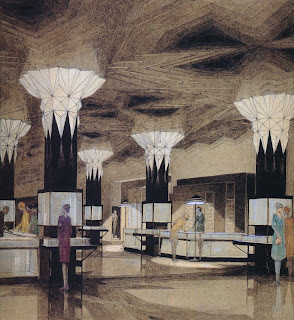 The sketch of the retail enviornment with the grand deco columns is wonderful. You're making us smarter and smarter. Thank you very much for your wonderful blog! DSM, the Kaufmann Department Store in Pittsburgh was spectacular. Bergdorf Goodman in Manhattan has a similar glamor. Now that's shopping! Thank you,Theo. I'm glad that you emjoy it.